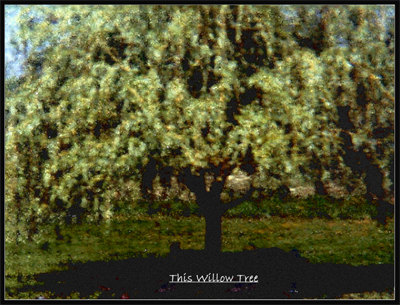 This willow tree saw the pattern of our lives on a dreamy day in May. reading from her grandfather’s third-grade textbook. Shelly and Spence are playing “house” under the boughs on the other side of the tree. Shelly plays the “Nurse”. And Spence is the “Hero” who dies. Spencer died as a 21-year-old “Hero”, and Michelle was in charge of the cardiac-respiratory unit. Me? I sit in my wheelchair, wondering what G0d has in store for my life. and He wouldn’t request something I am not capable of. Tru here. After developing dementia symptoms over the previous 12 years, on learning my dementia was probably irreversible and progressive, I also re-evaluated my priorities. Like Oliver Sacks, I discovered a feeling of detachment for politics and other issues over which I had little control. In September of 2006, I had investigated the Hebrew words “chesed v’ emet”. My word study showed that, according to my own personal vocabulary, these words meant “Truthful Loving-Kindness” or actions based on Loving-Kindness (chesed) with unwavering truthful reliability (emeth). I said to myself, “That is what I want my life to be about. As much as possible, I want that to be the description of me; the MEANING of my life. A year later, on my 50th birthday, I legally changed my name to “Truthful Loving Kindness”. This has been a consistent reminder of my life goal, and a guide for decision-making and priorities. Six years later I received a tentative diagnosis of dementia. No change in my life meaning, but a huge change in possibilities of how I could best accomplish demonstrating Truthful Loving Kindness. The minor issues fell away. I mostly lost interest in anything that was not in my own sphere of influence. Oliver Sacks put it well; it is no longer my responsibility. Now I collect and analyze data about myself and my dementia symptoms, writing about them weekly in this blog. I collect things written by other PWD (Persons With Dementia) and make various pieces of that collection available to others on a monthly basis thru the online collection of links called the “PWD Perspective” (link at bottom of page). Am collecting PWD Dementia Success Stories and hope to bring copies of that collection when I speak at the annual Alzheimer’s International conference at Australia in April 2015. Don’t get me wrong; yes, I “suffer” from my dementia symptoms. (And please do not complain about me using that term; as a Person With Dementia I personally am the ONLY person who has the right to say whether I suffer from my dementia symptoms.) If you follow my blog then you know I have hallucinations. I have mornings when I wake and do not recognize the man beside me in bed. I have months when I average three hours sleep per night, and those few hours filled with terrible vivid dreams that are more real than my daytime hours. These are all somewhat “expected” factors of Lewy Body Dementia, so not surprising in the least. My reading comprehension has dropped from University-level to fourth grade, so I can rarely find an enjoyable novel in which to escape, and it is progressively more difficult for me to analyze the data I wish to add to my collections. (In fact, now I collect only dementia data, almost exclusively from other PWD and often do not understand that either.) It is a rare movie or TV show that I can even tolerate, let alone enjoy. I can no longer enjoy music with more than one or two types of musical instruments. And rarely do I understand what is said on a phone call, because I cannot see the speaker’s mouth move, so it just becomes a mass of scrambled sounds that makes no sense. In short, I am slowly seeing everything I value in life being taken from me, in tortuously slow increments, requiring constant acknowledgements to loss and grief in order that I can fully enjoy whatever joyful moments await me in the future. That is part of the cost, but the benefit is that I have the privilege of describing what it feels like to experience those dementia symptoms. This is not a well-trained “expert” describing what they SUSPECT it must feel like, but what these symptoms feel like in my own lived experience. And as a fellow traveler on this path, I can also collect and share what other Persons With Dementia (PWD) have written about their own lived experience. * Admin issues: SHARE dementia awareness thru buttons below. If interested in receiving notice of future blog postings there is a “follow” button in the upper left corner (MS Explorer) or lower right (Safari and Chrome). Feel free to leave your thoughts in the form of comments, but please filter your comments with truthful loving kindness to all concerned. If there is an advertisement below, I have no control over what is shown. — Full legal name Truthful Loving Kindness copyright on 2015-02/24. 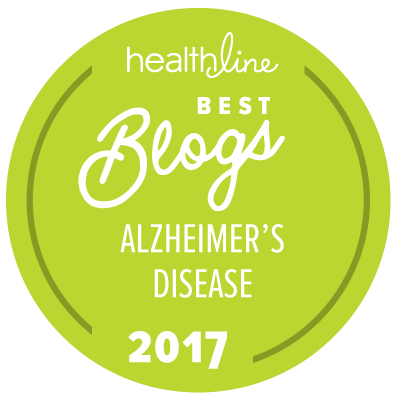 This entry was posted in Communication, Crucial, Important, Journal, Spiritual Aspects, Symptoms and tagged alzheimers, lived experience, purpose, sufferer, symptoms. Bookmark the permalink. Thank you, Tru, for your insight, candor, reflection and generosity in sharing your thoughts with us all. I want you to know I appreciate and acknowledge your strength and courage. Your readers benefit immeasurably from your writings and know that you are making a difference in how the world understands the world of PWD. Bless you! Thank you. And I hope there will be many more joyful moments to experience in the future. What kind of dementia were you diagnosed with? Still waiting for my follow-up tests (currently scheduled March 24 & May something-or-another). Told if does not yet meet criteria for Lewy Body Dementia, then need to watch real close, because I already have so many of the signs and symptoms. Do YOU have diagnosis? Yes. Complete neurological work up 6 months ago including brain MRI consistent with FTD. Johns Hopkins/NY. Where are you being worked up at? I’m still figuring all this out. UC Davis. Are you on FaceBook? I am not familiar with UC Davis. What made you choose this place? Do they specialize in this diagnosis? And I apologize if I am asking questions you have already answered in your blog. I just found it and am trying to catch up on reading. No, I am not on FaceBook. Too confusing for me. But, if you would rather correspond on email, my personal email (not employer) is Rose83616@gmail.com Thank you. Dewey decimal – I love it! I hope your fever is down and you are feeling better. This blog should be required reading for all carers! Thank you!!! Can I share your recommendation?